The Paleozoic era (from the Greek palaio, meaning "old" and zoion, "animals," meaning "ancient life") is an interval of about 291 million years defined on the geologic timescale as spanning roughly from 542 to 251 million years ago (mya), and as being the earliest of three eras of the Phanerozoic eon. The Paleozoic era is followed by the Mesozoic and Cenozoic eras. The Paleozoic era comprises from oldest to youngest the following six geologic periods: Cambrian, Ordovician, Silurian, Devonian, Carboniferous, and Permian. During the nearly 300 million years of the Paleozoic era, the fossil evidence records dramatic shifts in the forms of life on Earth. Although primitive vertebrates are known near the start of the Paleozoic, animal forms were dominated by invertebrates until the mid-Paleozoic, when fish populations exploded in the Devonian period (416-359 mya). During the late Paleozoic, great forests of primitive plants thrived on land; these would form the great coal beds of Europe and eastern North America. By the end of the era, the fossil evidence reveals the first large, sophisticated reptiles and the first modern plants (conifers). The start of the Paleozoic era, between roughly 542 mya and 530 mya, is a time when a large number of body plans appears for the first time in the fossil record. This Cambrian explosion, as it is called, offers a particularly stimulating challenge for all who would attempt to explain the phenomena. Indeed, all of the major body plans (phyla) of complex, multi-cellular, macroscopic organisms that exist today appeared in this time period, and since then no fundamentally new body plan has come into existence. The division of time into eras dates back to Giovanni Arduino in the eighteenth century, although his original name for the Paleozoic era was called "Primitive." Some scientists theorize that the Phanerozoic eon and also the Paleozoic era began shortly after the breakup of a hypothesized supercontinent at the end of a global ice age. 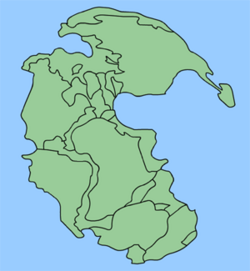 Throughout the early Paleozoic era, Earth's landmass was broken up into a substantial number of relatively small continents. Toward the end of the Paleozoic era, the continents gathered together into a supercontinent called Pangea, which included most of Earth's land area. The Paleozoic era covers the time from the first appearance of abundant, hard-shelled fossils to the time when the continents were beginning to be dominated by large, relatively sophisticated reptiles and relatively modern plants. The era's lower (oldest) boundary was classically set at the first appearance of creatures known as trilobites and archeocyathids. The upper (youngest) boundary is set at a major extinction event 300 million years later, known as the Permian extinction. Modern practice sets the older boundary at the first appearance of a distinctive trace fossil called Trichophycus pedum. At the start of the era at about 542 mya, life was limited to bacteria, algae, sponges, and a variety of somewhat enigmatic forms known collectively as the Ediacaran fauna. Within roughly 12 million years thereafter, a large number of body plans appeared nearly simultaneously (in geologic time scales) at the start of the era—a phenomenon known as the Cambrian explosion. This period marks a sharp transition in the fossil record with the appearance of the earliest members of many phyla of complex multi-cellular macroscopic organisms. The sudden appearance of so many phyla, combined with the fact that no new major body plans (phyla) have come into existence since the Cambrian period, is a remarkable historical event whose explanation, by any theory is a great challenge. Evolution scientists have marshaled several diverse disciplines to focus on that period, including , embryology, microbiology, cladistics, and traditional paleontology. While they have offered various possible explanations, none can claim to be definitive. Other scientists working primarily in the areas of Intelligent Design and creation science maintain that natural selection is insufficient as the directive root of such dramatic evolutionary change as occurs in the Cambrian explosion, and propose instead that in some way a supernatural designer must be the directive root of these evolutionary changes. There is some evidence that simple life may already have invaded the land at the start of the Paleozoic era, but substantial plants and animals did not take to the land until the Silurian period and did not thrive until the Devonian period. Although the fossil record from the start of the Paleozoic era includes primitive vertebrates, that record is dominated by invertebrates until the mid-Paleozoic in the Devonian period when there is a dramatic rise in the number of fish fossils. The late Paleozoic rock strata hold the evidence of great forests of primitive plants thriving on land with their remains forming the great coal beds of Europe and eastern North America. At the end of the Paleozoic era, the fossil record includes the first large, sophisticated reptiles and the first modern plants (conifers). International Commission on Stratigraphy (ICS). 2004. Homepage. Retrieved October 19, 2016. Natural History Museum. British Palaeozoic Fossils. London: The Natural History Museum, 1975. This page was last modified on 26 October 2016, at 15:52.